MMDU’s upcoming 4-day event UniversuMM is almost here, and as is the tradition, we’re expecting to witness a huge crowd from across the nation at university campus from Sept 27 to Sept 30. This National Level Youth Fest is shaped up to be a heart-throbbing event and to get updated, stay tuned with us for latest happenings. Until then, though, let’s walk through the major highlights of UniversuMM 2018. As always, the headliner at this year’s Youth Fest is going to be the Star Night. It is expected that a crew of celebrities will descend to MMDU campus to set the stage on fire and to take the whole youth by storm. So get set to jump on the remixes and peppy tracks at UniversuMM 2018 Star Night. Along with Star Night, UniversuMM is also expected to make you tap on the tunes during DJ night. MM(DU) is hosting Vh1 EDM/ Bollywood Night on Sept 27 featuring nationally acclaimed DJs ‘Audio Addict’ and ‘Akira’. Moreover, the youth fest is offering aspirants a direct way to Miss India 2019 by hosting Miss India Campus Placement Audition on Sept 30. Ms. Priyanka Kumari (fbb Colors Femina Miss India Intercontinental 2017) and Mr. Abhi Khajuria (Mr. India 2017 First Runner Up) are expected to be the judges of the event. You May Also Like: UniversuMM 2018 Preview: What can you expect? While the UniversuMM has earned repute for hosting a plethora of events every year, things are a bit different for the participants this year. Ranging right from Literary to Law, the National Level Youth Fest is open for students to showcase their talent in 100 different events, be it dancing or singing, the battle of words or battle of bands, painting or poetry, and many more. If you pursue proficiency and talent in any form of art, UniversuMM is the platform for you to make your presence felt as well as win lucrative cash prizes of 21 Lacs. UniversuMM helps budding stars monetize their talent. Thus, offers the cash prizes to the winners for showcasing their ability and talent. Though a number of activities are scheduled on the carte du jour of UniversuMM 2018, it is expected to witness fun options aplenty for those seeking to unwind with their friends and mates. 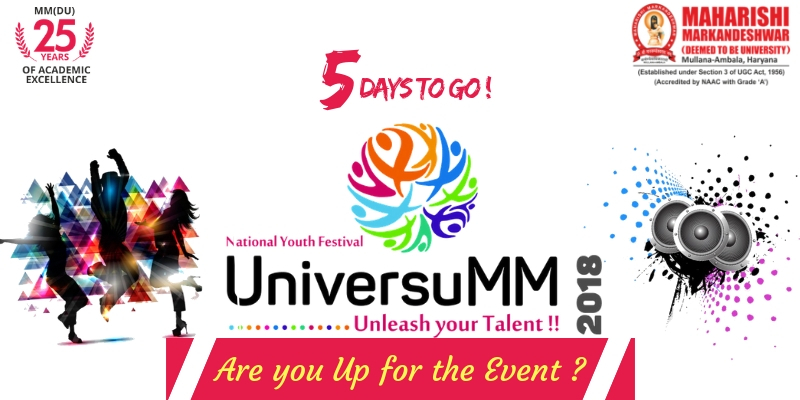 The National Level Youth Fest not only welcomes participants from India but also from other countries.Thus, you can watch a blend of cultural diversity on the stage of UniversuMM at MM(DU). Last minute surprises are a big part of the UniversuMM event, which means that there’s a space for something startling to show up. Be right back for previews and updates from all four days of UniversuMM 2018. Must Watch Event. I Will Surely Attend this Event..